The advantages of consuming a diet rich in organic fruits and vegetables are very well known. These natural foods are packed with natural vitamins, minerals, flavonoids and antioxidants, as well as other essential nutrients important for our health and able to help us prevent many serious diseases. There are plenty of fruits and vegetables which can be a great natural solution to lower diabetes risks and assist us in managing our insulin levels more effectively. According to the findings of an international research group from the United States, the United Kingdom and Singapore, using blueberries, apples, raisins and grapes can help us decrease diabetes risk to a great extent. The report about the study was published in August 2013 in British Medical Journal. 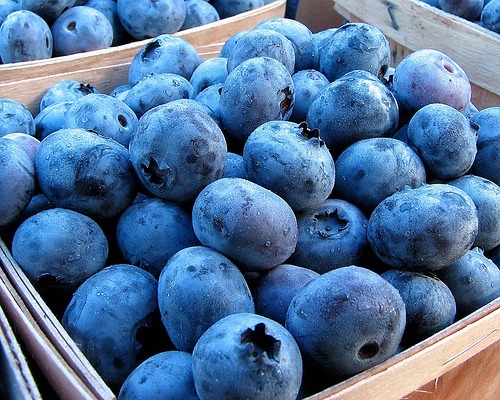 Further analysis has shown that those participants who reported consuming blueberries on a daily basis have up to 7 per cent lower diabetes risk compared to those participants who did not report consuming these berries. Slightly lower diabetes risks were also associated with daily consumption of apples, raisins and red grapes. The scientists found out that in order to maximize the discovered effects and use the benefits of apples, grapes and blueberries as a great natural protection against type 2 diabetes, it is recommended to consume at least three portions a day of the mentioned fruits. Certainly, consuming only fresh organic fruits free from various toxins and unwanted substances is recommended. At the same time, it is underlined in the report that substituting organic fruits with freshly squeezed organic juice has not shown its effectiveness as a natural diabetes risk reducing solution. Moreover, for some fruits (like strawberries, cantaloupe, and a few others), a regular consumption of freshly squeezed juice has shown even more links with type 2 diabetes risk. Actually, the researchers recommend using a full variety of organic fruits and vegetables as an excellent protection against many diseases and as a natural too to lower diabetes risks. “Individual fruits might not be equally associated with risk of type 2 diabetes in that fruits have highly variable contents of fibre, antioxidants, other nutrients, and phyto-chemicals that jointly may influence the risk,” it is stated in the report of the joint research group.